Here are a few basics for caring for your beautiful black skin. When you take a look at your daily black skin care regimen some things are taken for granted, some things we leave out and others we just forget. So this is going to act as a reminder for you and a checklist. Not everything will appear to be for your skin or caring for your skin but it is. Could Your Cell Phone Be Traumatizing Your Beautiful Black Skin? Everyday most of you use a cell phone, yet how often do you clean your cell phone. Something as simple as an anti-bacterial wipe will help you in preventing chin and cheek breakouts. Ideally you want to do this every morning or after your last call at night. If it's too much or you forget, make sure you do it at least once a week. Think about how many times you've put your phone to your ear and you've not cleaned your phone. Even with your blue tooth, you've put it in your ear but have you sanitized it lately? Clean your cell phone with an anti-bacterial wipe, especially if you put it to your ear on a daily basis. Is Your Makeup Brush Causing Skin Breakouts? If you're one who wears makeup on a daily basis, your brushes need to be cleaned because you're putting your brush in your powder or makeup repeatedly. And even though you've cleansed your face before applying your makeup, some of you do touch ups throughout the day. When you do a touch up, you've not cleansed your face and it has bacteria and germs just from the elements. If you've not cleansed your face and you use your touch up brush, you're picking up germs and now it's going into your makeup. In order to clean your brushes and to rid them of products that will ultimately clog your pores, you can wash them with a clarifying shampoo at least once a week. This will remove a lot of the build up that is on your brush. 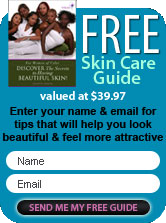 Do You Have A Black Skin Care Regimen? Also, when you're working through your daily black skin care regimen, you're going to have steps you're going to take. Cleanse, tone, moisturize and some of you are going to add a serum and sunscreen. The key to all of your applications, is when you're applying your products you'll want to use them in a given order working from the thinnest of your products to the thickest formulations so your skin will be properly sealed. Another beauty basic is when you know you're about to have a dinner party or an important meeting, it's advisable that you don't risk having a facial the day before. This is really important for the brides because a facial can sometimes leave your skin looking red and this will all depend on the treatment that you had. If you've had blackhead extractions or a deep pore treatment then typically you're going to have a beautiful end result but not always. Sometimes depending on how the esthetician manipulates your skin, you will have little flare ups of redness occur. This is not something you'll want to have done the day before an important meeting, party or wedding. You can always treat yourself at home the day before with a honey-hydrating mask. It'll kill the bacteria and be very soothing to your skin and leave a healthy, luxurious glow. We'll wrap up this particular article with the fact that when you are working with your skin, some of you are beginning new regimens and in the scheme of things we all have new skin care regimens and they take time. Most of you want a fast solution and it's just not going to happen. If you're patient and allow 3 to 6 months for an acne treatment and others alike, this will give you time to see just how well the product is working. It's not going to happen after one treatment. You will see results but you must give your skin time to adjust to the regimen itself. When you are embarking upon a new regimen for your skin in particular, understand that the skin care product is the topical element, what you put on your skin. But the key factor that's going to help balance out your skin is your diet. You can't go to a skin care therapist and seek treatment for acne breakouts, maturing skin breakouts or flare ups and not be conscious of the foods that you take in.